So a new exercise facility has opened up in the Ottawa area and it is glorious. I had driven past the HUGE building a couple months ago and thought “now that is something I can get behind”. So now that it is open I rounded up some girlfriends to see if they wanted to come and bounce with me. The new facility is called Sky Zone and it describes itself as a Trampoline Park, and well that is exactly what it is, a gymnasium filled with giant trampolines and it is glorious! Once I explained what it was all about it took very little convincing to get a group of five signed up for the “skyrobics” class. 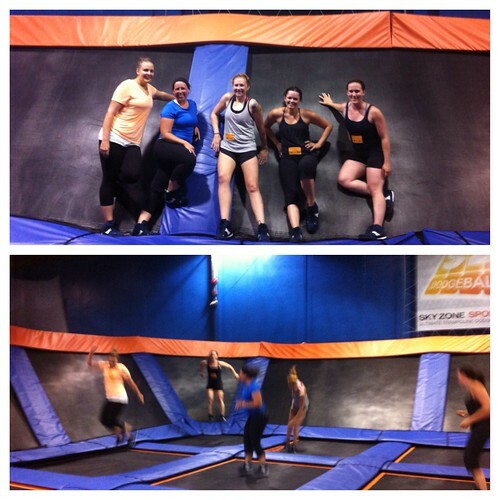 The Skyrobics class is basically an hour of guided bouncing fun. Going into it I thought “how hard can bouncing be, there is no way this is going to be a killer workout“, however halfway through the class I thought to myself “I thought I had better cardio endurance than this“. 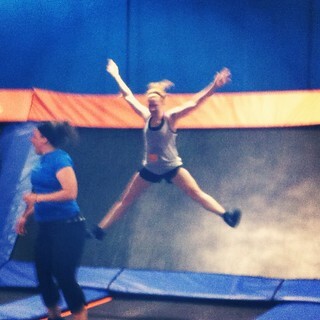 It was challenging, maybe because I haven’t been on a trampoline since I was maybe 10, and it was a lot of fun too. I can’t remember the last time I laughed at myself so much, felt ridiculous, and had a blast all simultaneously (maybe Zumba). The down side would be that I wore shorts, do not wear shorts if you choose to go, so my knees got a little “burnt” and bruised. It would have been nice to bounce barefoot but you had to rent shoes like at a bowling alley, however I can understand the reasoning behind not wanting a million dirty little feet jumping all over their trampolines. Besides these two tiny thing (one of which was under my control) I thought the whole thing was pretty fantastic! Something that I will definitely try again, to see if I can get more brave at some of the moves. So I would highly recommend trying it out if you are looking for something fun and healthy to do with your friends. The same day we went bouncing around on trampolines I figured it would also be a great day to do my final testing for the new leg workout (because you don’t need your legs to jump on a trampoline right?!? so wrong!). When creating this workout I approached it differently. Instead of writing out the exercises and working my way through it before deciding on a name I decided to name it first and then pick exercises that would the name justice. So I called it Killer Legs and got to work picking some exercises that would definitely make you feel the burn. Susan came over and we got to testing it out. We figured that it wasn’t “too” hot outside and started the workout outside, but quickly overheated and finished off in my lovely air conditioned house so no one would get heat stroke. This workout will have you sweating up a storm in no time! However unlike the man in this video be sure to land softly on your feet, and when jumping push through your heels to protect your knees. Also if you are going to be swinging your arms like the gentlemen in this video be sure to make them controlled movements, don’t just flail your arms, your jump should be coming from the power of pushing off through your legs not the swinging of your arms. I hope you enjoy the workout and enjoy the burn. Be sure to take no more than 1 minute break in between sets. Three rounds should take just a bit over 30 minutes so there is no excuse not to get in a little leg workout. This entry was posted in General and tagged fitness, friends, fun, health, Leg day, sky zone, trampoline, workout by healingginger. Bookmark the permalink.